The Powder Coating Institute (PCI) currently represents the North American powder coating industry, promotes powder coating technology and communicates the benefits of powder coating to manufacturers, consumers, and government. 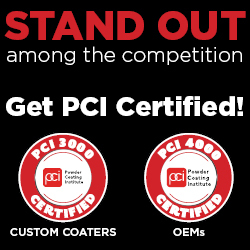 PCI’s goal is to become the Voice of Powder Coating Worldwide. The Powder Coating Institute is committed to serving its members by promoting the benefits of powder coating technology.